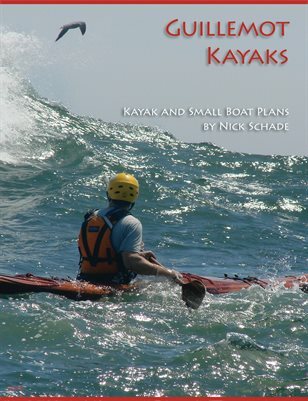 These plans are product of Nick's years of boating experience and extensive research into what makes boats work. Each design starts out as an idea spawned on the water. Time out in boats will suggest how a boat could be tailored to perform better in specific conditions. The idea may be for something that works better poking into a salt marsh or for dropping down the wave face of hurricane surf. Inspirations for solutions come from traditional Inuit and Aleut kayaks as well as more contemporary powerboats and sailboats. After a concept is born Nick will sketch up some ideas on paper, attempting to get the basic shape developed. From there the sketched ideas will be transferred to the computer and a naval architecture CAD package. CAD does not design the boat, it is just a fancy tool for drawing and analyzing the result. The design is initially roughed out and analyzed for basic hydrostatics, i.e. how and where it floats. The shape is then tweaked as needed and reanalyzed. This process is repeated as long as necessary until the basic concept appears workable. Then the design is further analyzed for more complicated hydrostatics such as stability and the various form coefficients such as the prismatic. The effort here is to bring these performance related parameters into line with the initial design goals of the desired boat. This iteration continues with needed adjustment and further analysis until Nick is satisfied that the boat should perform as desired. Then starts a process of further hydrodynamic analysis and alterations looking a factors such as drag and how the boat reacts in waves. This may involve some significant changes to the boat which will require returning to some of the earlier iteration processes to keep the design focussed on the design goal. Finally the design will be refined for aesthetics and to assure the boat is buildable using the intended method. With stitch-and-glue design this means making sure the plywood panels will bend into the intended shape. With strip-built designs, which can almost always be built, the goal is to assure that the shape is not unreasonably difficult to build. If this requires major changes it may mandate a return to earlier steps in the process. All of these tasks often take Nick a year or more. The whole process is fed by constantly returning to the water and using different boats in a wide variety of conditions to see how they respond. If the newly built boat does not handle well Nick does not release the plans. If the design works well final drawings are prepared and the design is made available to boat builders. Testing of the design continues for as long Nick owns the boat. It typically takes a full year to really get a full understanding of how a boat handles. This gives the opportunity to test it in a wide variety of conditions. Nick paddles his boats year around along the coast of New England, putting over 1,000 miles on most new designs in the course of its first year. If any issues come to light in the design, adjustments will be incorporated. And during the year new ideas for new boats optimized for different conditions will start to percolate leading to new boats in the future. New designs that are still in the works can be viewed here.